When light rail service begins in 2018 2019, a lot about taking transit in Ottawa will change. With some helpful additions from OttawaStart.com, here are the details on Ottawa LRT. OC Transpo already rolled out most of its bus changes at the beginning of 2017, renaming express routes to connexion. Now, most buses will have a connection to a nearby LRT station. You can find out how local bus service near you will change post-LRT with an interactive system map on OC Transpo’s website. The first phase of LRT, which is the 12.5 kilometre Confederation Line, has 13 stations between Tunney’s Pasture in the west and Blair in the east. You can read more about the post-opening plan at stage2lrt.ca. How much faster is LRT? OC Transpo says a trip from Tunney’s Pasture to Blair will reliably whisk you across in 25 minutes, allowing you to sidestep weather and traffic. OC Transpo did not provide an estimate for how long it currently takes by bus, either under the worst or best conditions. Train stations will have fare gates (the Trillium Line will have them installed this summer) where passengers scan their Presto card or transfer barcode. In stations without fair-paid areas, you will have to go through a fare gate to get onto the train or tap your pass when boarding a bus. Ottawa is using Alstom Citadis Spirits as its light rail vehicle on the Confederation Line. There are 34 cars in the fleet and 17 trains will run on the line. They will come about every five minutes during rush hour and every 15 minutes after midnight. They will run from 5 a.m. until 1 a.m. Mondays to Thursdays, then until 2 a.m. on Friday, from 6 a.m. to 2 a.m. on Saturday and 8 a.m. to 11 p.m. on Sunday and holidays. The trains usually will consist of two Citadis Spirit cars, but they are modular meaning more can be added to meet demand. At peak periods, a train will carry up to 600 passengers.The shorter 48 metre length has a nominal capacity of 300. Which one is the O-Train? Right now, the only O-Train is the Trillium Line, which runs for eight kilometres north to south between Bayview and Greenboro. After stage two LRT is finished and the Confederation Line opens, the term “O-Train” will refer broadly to both light rail lines. To differentiate them, the lines have unique names as well as numbers – Confederation is line one. Because the Trillium Line will become the number two train, say bye-bye to the venerable number two bus that runs between Bayshore and downtown (now it’s route 11). What happens to the O-Train Trillium Line? Not much is changing for now. It will continue to be served by six Alstom Coradia Lint trains, which have a capacity of 260 passengers each. They run about (emphasis on about) every 12 minutes on weekdays and every 12 to 15 minutes on weekends. 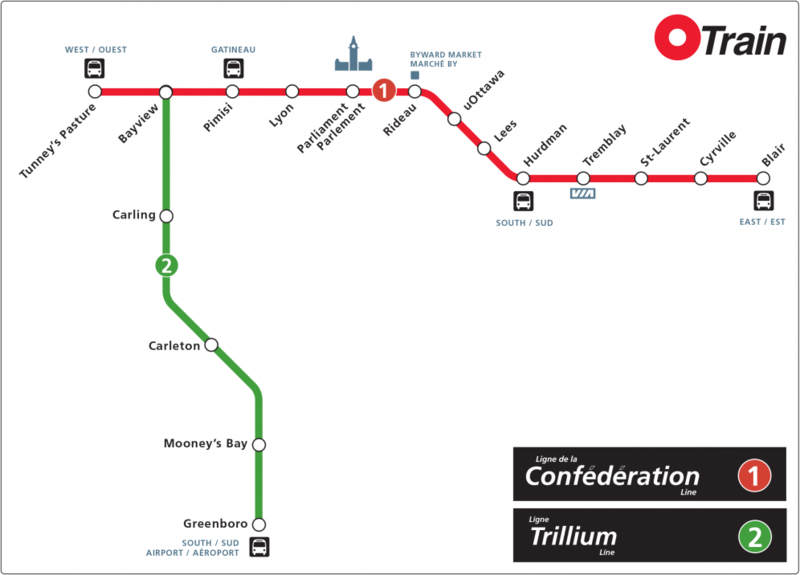 The Trillium Line’s schedule is adjusted seasonally and it’s not clear if the Confederation Line also will. 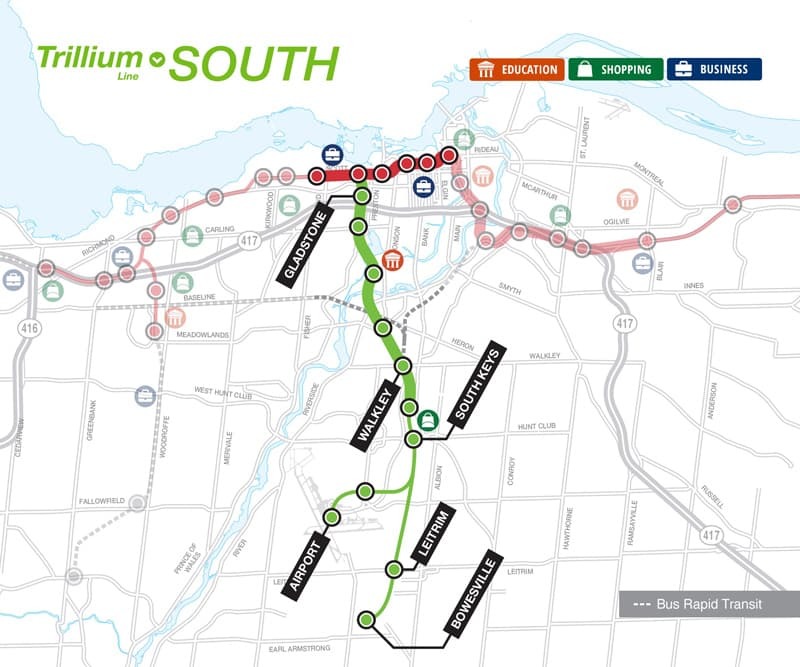 Most of the focus has been on east and west expansions to the Confederation Line, but a future phase coming around 2021 will also expand the Trillium Line 11 kilometres further south from Greenboro to Bowesville. There will also be a three-kilometre leg to the Ottawa Macdonald-Cartier International Airport. The line will close in spring 2020 to accommodate the work and will reopen into 2021.